Lake Elsinore, CA – Recent modeling and testing results demonstrate that the work performed by the Lake Elsinore & Canyon Lake Total Maximum Daily Load (TMDL) Task Force and LESJWA has helped further identify the sources of nutrients, which harm water quality at Lake Elsinore and Canyon Lake, and also support ongoing efforts to reduce nutrient loading as reflected by lake improvements implemented since 2000. A landmark TMDL Revision and Update reflecting these updates is currently going through final review by the Regional Board. often have negative impacts to our lakes. Complying with all the requirements of the TMDL is not an easy feat. Back in 2004, following watershed modeling, the collection of hundreds of water samples and analyzing of data, a TMDL was determined. Along with the TMDL, suggested methods and strategies to reduce the high nutrient loads were made. Over the past 19 years, LESJWA along with over 20 agencies, have implemented strategies to better refine nutrient loading and implement measures to improve water quality at both Canyon Lake and Lake Elsinore. These projects include the installation of an aeration system in Lake Elsinore, alum applications in Canyon Lake, a pipeline to transport recycled water into Lake Elsinore, fish removal and sediment removal. LESJWA is a joint powers authority entrusted with state and local funds to improve water quality and wildlife habitats in Lake Elsinore, Canyon Lake and the surrounding San Jacinto watershed. For more information about LESJWA, please visit www.mywatersheds.com. Lake Elsinore & San Jacinto Watersheds Authority (LESJWA), is informing the Canyon Lake community that doses of alum will be applied to the lake in the main body, east bay and the area north of the causeway from February 12-16, 2018. Stormwater runoff carries with it high levels of nutrients including nitrogen and phosphorus that hurt water quality and threaten aquatic life. This dose will be the seventh Canyon Lake alum application that has taken place. Alum, the method selected to provide the best results for Canyon Lake, has a proven track record of success and is safe to both humans and aquatic life. Drinking water quality will not be affected by any of the treatment options. Canyon Lake will remain open during the entire treatment process. Recreational users will experience little disruption during treatment application and implementation. 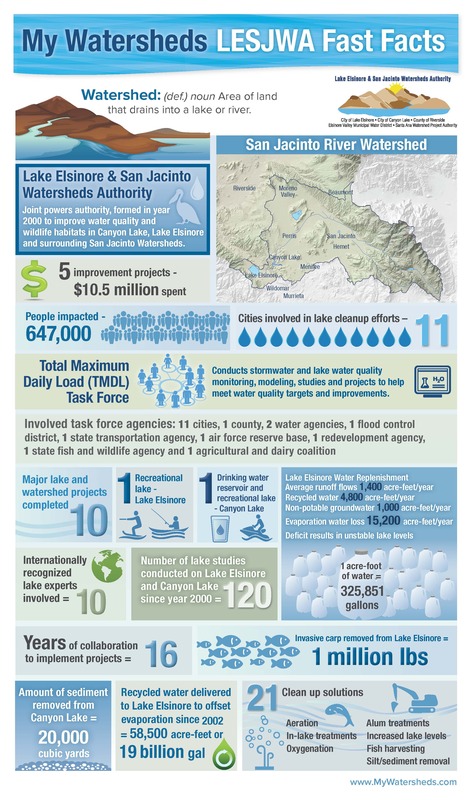 In order to comply with water quality regulations enforced by the State through the local Santa Ana Regional Water Quality Control Board, the Lake Elsinore & Canyon Lake Nutrient Total Maximum Daily Load (TMDL) Task Force using local stakeholder funding to continue alum water treatments in Canyon Lake. The TMDL Task Force evaluated several options during the CEQA process and determined that alum application provides the best option as a step to effectively treat the entire lake in a timely manner with minimal impact to Canyon Lake residents. • Monday, Feb. 12 Holiday Harbor 7:00 a.m. – 4:00 p.m.
• Tuesday, Feb. 13 Holiday Harbor 7:00 a.m. – 5:00 p.m.
• Wednesday, Feb. 14 Holiday Harbor 7:00 a.m. – 3 p.m.
• Thursday, Feb. 15 East Ramp 7:00 a.m. – 2:00 p.m.
Lake Elsinore & San Jacinto Watersheds Authority (LESJWA), is informing the Canyon Lake community that doses of alum will be applied to the lake in the main body, east bay and the area north of the causeway from September 25-29, 2017. Stormwater runoff carries with it high levels of nutrients including nitrogen and phosphorus that hurt water quality and threaten marine life. This dose will be the seventh Canyon Lake alum application that has taken place. Alum, the method selected to provide the best results for Canyon Lake, has a proven track record of success and is safe to both humans and marine life. Drinking water quality will not be affected by any of the treatment options. Canyon Lake will remain open during the entire treatment process. Recreational users will experience little disruption during treatment application and implementation. • Monday, Sept. 25 Holiday Harbor 7:00 a.m. – 4:00 p.m.
• Tuesday, Sept. 26 Holiday Harbor 7:00 a.m. – 5:00 p.m.
• Wednesday, Sept. 27 Holiday Harbor 7:00 a.m. – 3 p.m.
• Thursday, Sept. 28 East Ramp 7:00 a.m. – 2:00 p.m. The due date is 4:00 p.m. on Monday, November 21, 2016. Learn how water scientists conduct routine water quality sampling of Lake Elsinore. This is just one of many ways the LESJWA organization is working to improve Lake Elsinore. On Wednesday, April 27, 2016, the LESJWA Water Summit took place. Presentations were shown to detail how the current drought is impacting our region, what LESJWA is doing to further protect the local watersheds, the accomplishments made, and upcoming major projects to help reach water quality goals. The Lake Elsinore & San Jacinto Watersheds Authority (LESJWA) wishes to retain a firm experienced in alum application services for Canyon Lake. The proposal should provide a detailed scope of work, a description of equipment, project schedule, and compensation budget. Please click on the project title link above for full details. The due date is 4:00 p.m. on Monday, November 21, 2016. For more information, please contact Mark Norton at (951) 354-4221 or mnorton@sawpa.org. Subsequent to the April Alum application, an algae bloom was observed in several coves. As in the past, a press release was shared with the media indicating that the cause of the algae bloom in the coves was not the alum, and that the algae would likely dissipate over time. Below are a few articles that have been released regarding this event. NEWS UPDATE AS OF 8/18/15: All coves in Canyon Lake are now clear of algae and are safe for swimming and recreation. For more information on the Canyon Lake Alum Treatment Project, please visit: http://www.mywatersheds.com/the-watershed/canyon-lake-alum-treatment-project/.